The Mesoamercian Barrier Reef creates a protective barrier to the many islands along its length as well as a habitat for thousands of marine life forms. However, recent studies have shown that many corals that create that barrier are stressed by climate change; some more than others.On Wednesday February 23rd, the Lion's Den was the venue for a presentation of the 2009 - 2011 results of the Strengthening Coral Reef Resilience to Climate Change study. Presented by Lisa Carne, Independent Consultant and Biologist, the presentation started at 7:00pm. Ms. Carne, with funding from the World Wildlife Fund, the Caribbean Community Climate Change Center based in Belmopan, and with initial funding by the World Bank, has embarked on a bold project to create nurseries where corals are grown. Lisa informed The SPSun, "In a nut shell the project is basically coral nurseries - growing corals in sea tubes - meaning out in the field not in a laboratory - and we're focusing on the Acroporids family that's the (Elkhorn, Staghorn and hybrid) the most important reef building corals, the fastest growing corals and branching corals. Their abundance has been reduced by over 99% Caribbean wide within the past 30 years directly due to climate change, and because of the increased intensity and frequency of hurricanes, bleaching events and disease". The project capitalizes on the fact that these corals can asexually reproduce and on their adaptability to high wave areas. The project involves gathering samples of these resilient corals into coral nurseries to produce gene banks with the objective of out-planting to climate change adaptation reef patches to encourage natural reproduction. According to Ms. Carne, the idea came to her during a visit to Ambergris Caye, while doing some work on the reefs in 2002 when she observed living pieces of the Elkhorn corals on the reef broken and free but still alive. This gave her the idea that there is a possibility to re-forest the reefs or plant back corals. These corals, if broken from their root and lodged, will re-grow. After doing some research, Carne discovered that Dr. Austin Bowden-Kerby had previously published on this work. The project commenced in 2006 in Southern Belize after Hurricane Iris decimated Laughingbird Caye National park. In 2009 Dr. Austin Bowden-Kerby visited Belize with funding from the World Bank and assisted in the setting up of the first nurseries. Currently, the program has six nurseries in Southern Belize, three at Turneff and two small ones at Hol Chan National Park. To date over 3,000 fragments have been successfully planted, however, according to Ms. Carne that is not enough. The long term goals of the project include saving the species from extinction, restoring lost ecosystem functions by out-planting genetically diverse Acroproids and understanding better the biology of "resilient" corals. On Thursday February 24th, the team out-planted corals onto some reef balls that were set into selected grassy areas in front of the island in the early 90's. 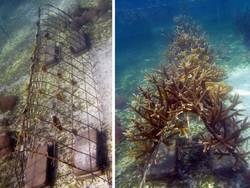 This technology is hoped to be used to replant reefs damaged by groundings or after hurricanes and other natural disasters.